It’s taken me over 20 years to get around to shooting the magnificent art deco industrial buildings on my own doorstep. But I had to wait until the light was just so. Like this afternoon. The stretch of the Great West Road which they flank is known as the Golden Mile and we Brentfordians are rightly proud of them. They were built more or less in the decade from the late 1920s to the late 1930s. 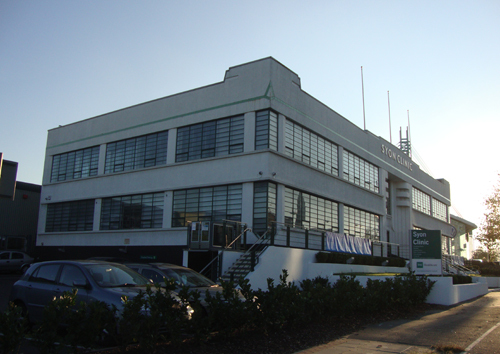 The legendary Art Deco specialists Wallis, Gilbert and Partners loom large. Many of the buildings were erected by American manufacturers who needed to establish UK bases to get around trade tariffs. On the north side of the road we have the brick Gillette building which dominated the area until the massive Glaxo SmithKline steel and glass complex was raised in recent years. Gillette moved their manufacturing to Poland in 2006. The building is currently disused. On the south, partially opposite GSK we have three classic units along a stretch of several hundred yards, all cream/white. These were at one time counterbalanced by the legendary Firestone factory opposite, on the north side. Tragically, this building was hurredly demolished by developers over a weekend in 1980 before the authorities could get it listed. 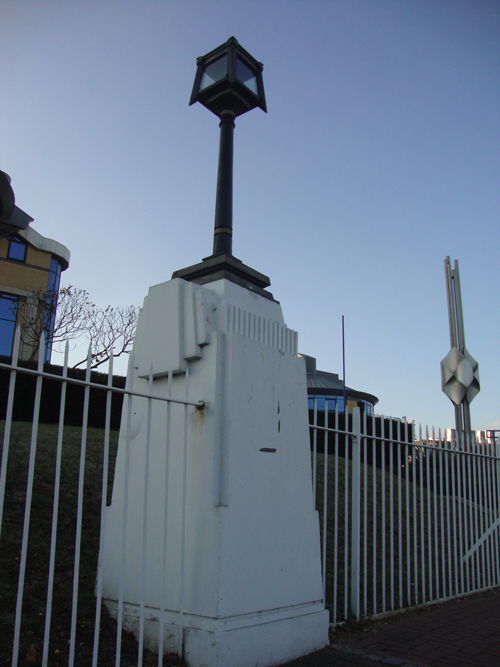 All that remains are some forlorn Art Deco lamposts at the west gate. Unbelievably, the rather fetching central gate was torn down in 2004 to make way for extra parking. 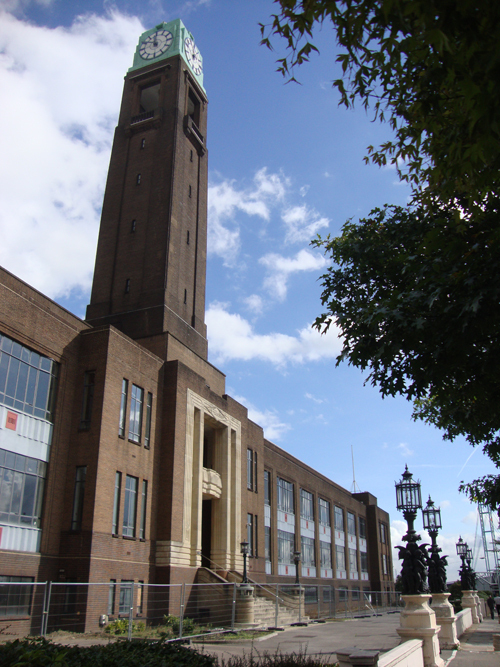 If you’d like to visit these lovely structures, I recommend you park in PC World car park (in West Cross complex, where Firestone was), or take a short walk from Brentford or Syon Lane mainline stations. I have omitted Wallis House (old Beechams building), further to the east next to the M4 flyover. Also Wallis, Gilbert & Partners, c1940. Picture here. Gillette Building, Sir Bannister Flight Fletcher, 1936-37. Art Decaux! JC Decaux building, formerly HQ of Currys, 1936. This lamp post is a surviving reminder of the Firestone factory, destroyed in 1980. Makes me feel old when they where put up just before I was born. 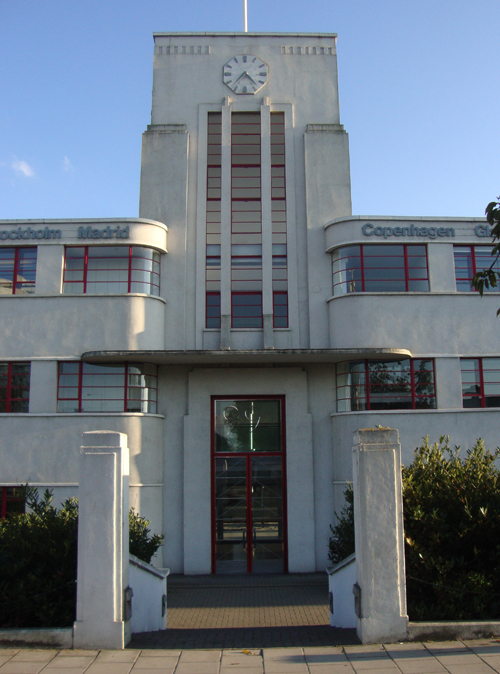 They are fantastic Deco buildings, even more fantastic because they were industrial and not residential. The Old Coty Cosmetics building, called Syon Clinic in your photo, is a particular delight! 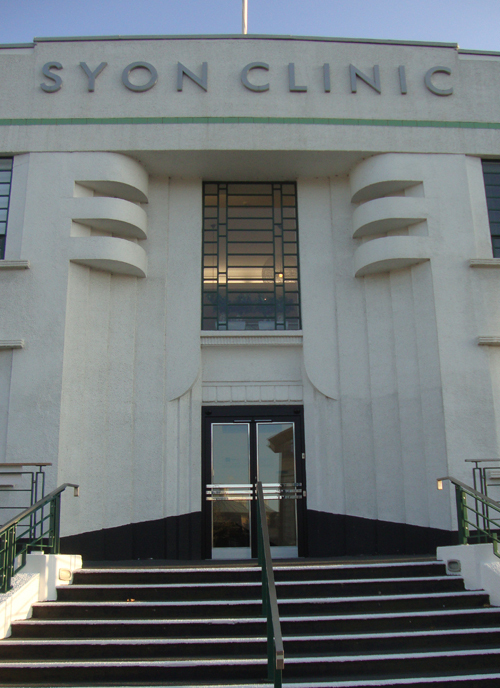 Do the remaining Deco buildings in Brentford’s Golden Mile have heritage protection? A notable collection. Let’s hope they can be protected and preserved. Such buildings contrast so pleasantly the dreadful commercial buildings that are being foisted on us today that are systematically degrading our city environments. Shame about the Hoover building. I remember the nighttime OOOps! with the bulldozer bringing down the main entrance. So interesting ! 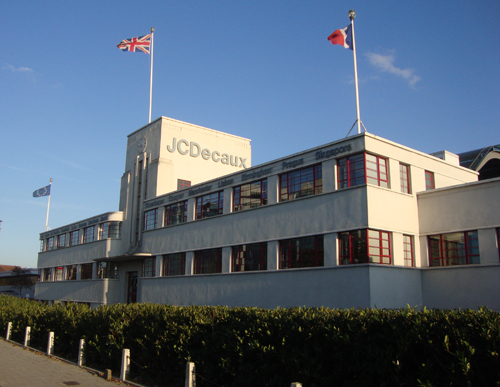 I’ve just published a book about another British art deco factory, deisgned by Thomas Wallis, close from Paris, in Chatou. 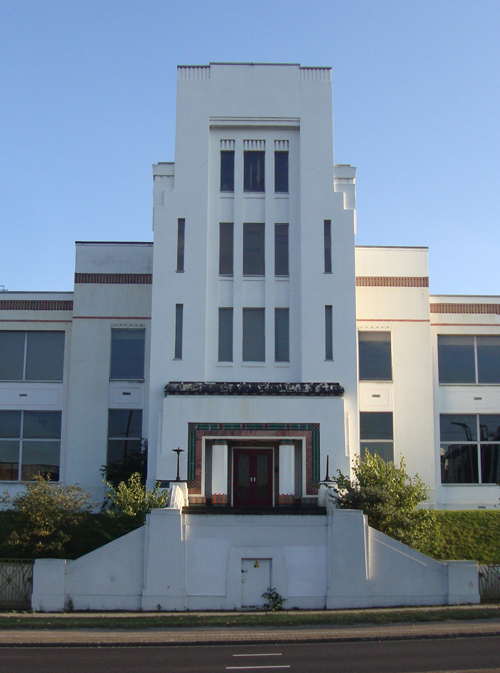 We are a group of local people in Leamington Spa, who are trying to get listed status for an art deco factory known as ‘Flavels’. 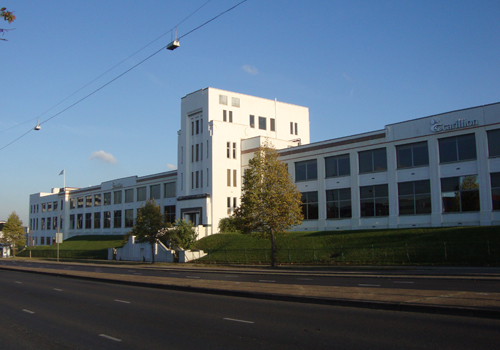 It seems that the regular factory architect designed it in 1936 – but it also has a strong sense of the influence of the Wallis and Partners style. 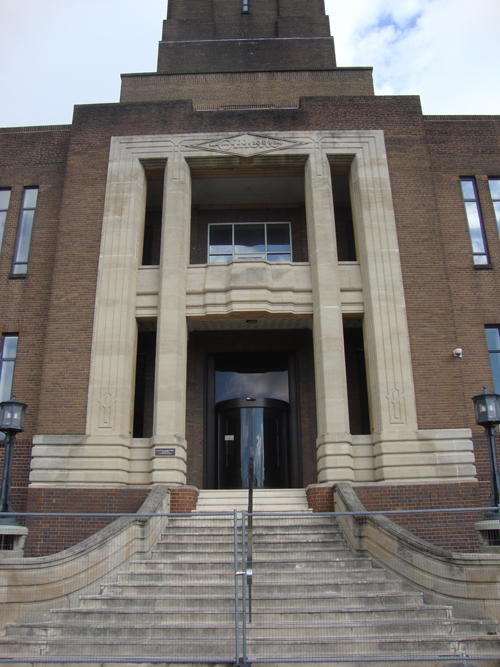 I wonder whether you might help us – perhaps by commenting on ‘our’ building? Perhaps you (as an expert) might be able to correspond with us a little and advise on what we could say about the building, or about the architect (surname Willcocks, and probably a cousin of the more well-known Bernard Willcocks). is your book about Pathe Marconi still available? the inside of the coty cosmetics building has been destroyed (now replaced with modern horrid stainless steel etc) the only bit of the original seems to be the lovely banister on the stairway.